Experiment record on an A4 size paper in a vertical, portrait orientation. 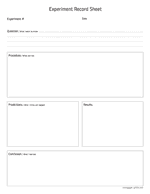 On this sheet you can record all important steps of an experiment, from the question to the conclusion. Experiment record on a letter size paper in a vertical, portrait orientation. 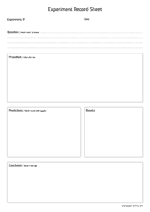 On this sheet you can record all important steps of an experiment, from the question to the conclusion.